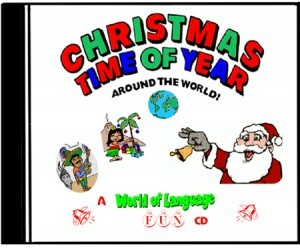 Sing along with the Christmas song, learn all about Christmas celebrations in different countries around the world and learn to say Merry Christmas” in TEN different languages, right along with the Christmas Elf! For more Christmas music check out our newest released The Christmas Star and La Estrella de Navidad. 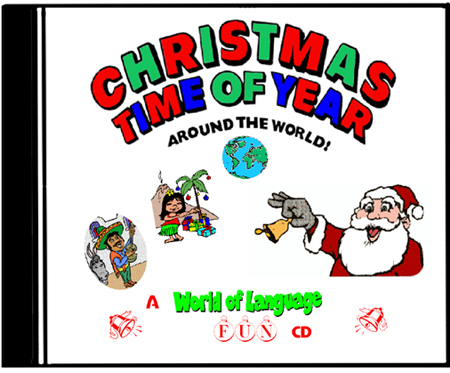 Kids learn about Christmas around the world and learn the phrase MERRY CHRISTMAS in German, French, Italian, Japanese, Polish, Spanish, Hawaiian, Swedish Hungarian and Norwegian. “I have as much fun as my children learning to say MERRY CHRISTMAS in the different languages, and we love learning about customs around the world . . .” Pittsburgh, PA. Bonus Track: “Fiesta Navidenas” sung in Spanish!